When Miriam and Bruce Cullen went shopping for a new boat, one thing was certain: It had to feel like home. For cruising in the Pacific Northwest, they wanted the shelter of a pilothouse with super visibility. But they also wanted a flybridge because the sun does shine occasionally in their rainy part of the country. They entertain on board, so the Cullens wanted a good galley and a spacious saloon. Bruce demanded a responsive boat, one that handled well and tracked nicely on a given course, because he is a predicted log racer on Puget Sound. They did not want a fast or powerful boat. Miriam, an interior designer, sought an interior that would have a contemporary appearance amenable to her design philosophies, plus space for guests, without sacrificing the character of the boat. That sounds like asking a lot from one boat. There was more, however. As former owners of a Northwest boating icon, a 44-foot Tollycraft, they knew they did not want a down-galley design, or a boat requiring extensive use of ladders and stairs. Access to the engine room had to be convenient, and working there should be easy, not requiring one to crawl around. And any new boat must be seaworthy, stable and safe, they said. The Cullens were not being fussy. Experienced boaters, they knew what they needed for their lifestyle and boating preferences. They chose another Western-built yacht: the new 40-foot Pacific Trawler. A big sister to the 37-foot Pacific Trawler, which was designed in the early 1970s by Blaine Seeley, a Southern California naval architect, the raised pilothouse 40PT proved to have the space and flexibility to satisfy the Cullens. Roger Drill, owner of Pacific Trawler, who builds the boats in Bellingham, Washington, had just updated his design for the 40-footer when the Cullens began searching the market for a new boat. The flexibility of that design, and Drill&apos;s willingness to make some other modifications, sold the Seattle couple. Originally, Drill offered the 40 with an open transom, with a U-shaped stainless steel railing in place of the traditional transom. The new version shows a closed transom and an aft saloon bulkhead that can be moved during construction to provide-at the buyers&apos; choice-a huge cockpit and a standard-sized saloon or the reverse, a smaller cockpit and an expansive saloon. Miriam showed up at the boat in Seattle&apos;s Elliott Bay Marina first, so she gets to tell the story about how they bought the yacht they named Caroline II and how it changed and was improved over time. Bruce, chief of anesthesiology at Harborview Medical Center in Seattle, was on his way through afternoon traffic. "Bruce was sold the moment he saw it," Miriam says. "He visited other Pacific Trawlers and their owners and he hit it off immediately with Roger." And Miriam? "I was digging in my heels esthetically," she explains. There was much in its favor, she says. The Ushaped galley was nice, particularly for someone who is a creative cook and likes to invite 35 to a dock party. The boat moves easily at 8 to 9 knots, and that also was good. "We were not interested in speed," she says. "We like the stability of the boat, and that was the deciding thing," Miriam adds. "It was wonderfully assuring." There were problems that clashed with her design sensitivities. The Diamond/Sea-Glaze windows on other Pacific Trawlers had black trim. The saloon seemed cramped for a party. The settee was not really comfortable. And, etc. On the one hand, it was a stout, seaworthy yacht. On the other, there were these problems. Miriam knew what to do. "I spoke up," she says. "The decision to buy was about to be made and we asked Roger about the windows (could the trim be white? ), and he said, &apos;I don&apos;t know why not.&apos;"
At a later meeting, she spoke up about the size of the saloon. On the plan for their boat, the saloon would be about 13 feet long. Was there a way to make it larger? "Roger said he was doing one (a PT40) that had a larger saloon. I asked, &apos;Roger, is it too late?&apos; Roger said there was plenty of time. "So we got an extra 3 feet of space in the saloon. It opened it up. The boat became a very nice architectural statement. For a small boat, it has a lot of style. It is juicy. I love it," Miriam says. "Our Tolly had a full bridge enclosure, and I didn&apos;t like it," Bruce says after his dash from the hospital. "It had better visibility from the bridge, and I often needed to be there because I couldn&apos;t see well from the lower helm. But Northwest weather often found us below most of the time. "I wanted a pilothouse. I wanted to be inside in the winter, but on those rare, wonderful Northwest days we can hop up to the bridge." The Cullens found boarding the Tolly to be awkward and were not happy with the ladders and steps needed to get around the boat. "We&apos;re not getting younger," he adds, "and I wanted to do less of that. The beauty of this boat is that you just walk in." 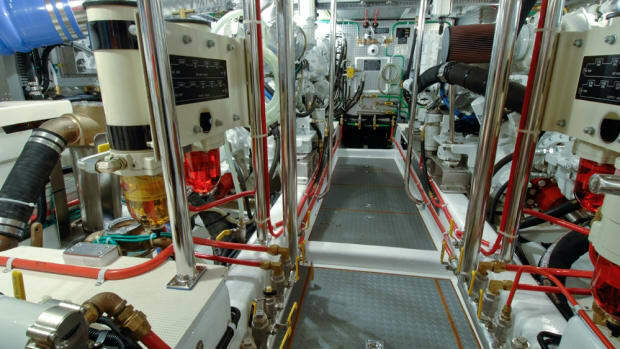 Engine room access on the Pacific Trawler is easy, and a new stainless steel step makes it better. The Tolly had twin Caterpillar diesels and would cruise at 12 knots. "Why do we need all this power?" the Cullens asked themselves. "We don&apos;t want to go fast." It wasn&apos;t a totally easy decision, however. "There was some trepidation about buying a boat with a single engine," Bruce explains. "My son-in-law said, &apos;Here&apos;s your get-home&apos; and handed me a cell phone." Problem solved. The Cullens chose a 220-horsepower Cummins diesel. Pacific Trawler offers Cummins engines to 370 horsepower, but the couple is happy with the speed the smaller engine provides. Standard equipment also includes a 4-horsepower bow thruster. "I&apos;m a techie kind of guy, and I use a lot of computer technology to plot the courses, using Nobletec," Bruce says. "I do my planning on an Excel spreadsheet. Running it is fun, just to be on the boat is fun." The Cullens&apos; son usually drives the boat, while Bruce navigates. Precise helmsmanship wins predicted log races. "Both my son and I have remarked on how much better this boat tracks," Bruce says. "You&apos;ve got only a single screw and a big rudder." With the boat under construction, Miriam went to work. She approached the interior design of the Pacific Trawler as she would any other project of her business, Miriam Cullen Interiors. "It&apos;s important to decorate with meaning, with things important to you," she says. "Everything here has meaning for me." At Miriam&apos;s request, Drill specified invisible hinges on all cabinet doors. Oiled Honduras mahogany is used throughout the boat; cherry also is available. Ceiling and walls are covered with soft, off-white vinyl and contrasting mahogany battens. Looking for something that spelled home, Miriam had some old Turkish Kalim carpets that had been in their home for years cut and sewn into pillows. The carpets&apos; earthy tones- cinnamon and paprika-are warm against the gray fabric of the settee. "I prefer earthy colors," Miriam explains. "The boat needs to be a bit rugged, to look like it has some guts." A large, metallic "C" on a bulkhead honors Bruce&apos;s mother, for whom the boat is named, and the name Cullen. A table lamp, a gift to Bruce from associates, is made from an old anesthesia vaporizer. With its technical, almost Star Wars styling, it is an exclamation point in the saloon. Nylon carpeting, "Monarch Butterflies," covers the saloon sole. The small figures in the carpet pattern do have a butterfly look, and their colors echo the rust and paprika in the pillows. But change the angle of your vision and the woven figures look like schools of small fish. Rather than use hardwood surfacing on the galley sole and in the head, Miriam applied "Monarch Butterflies" and then covered it with a semi-rigid vinyl product called Bolon. It resembles sea grass and can be scrubbed. It protects the butterflies from the spills that are inevitable in a busy galley. Miriam selected a gray-hued laminate for the galley counters. The face of the galley cabinets are also laminate, while the drawer and cabinet fronts, however, are mahogany. The microwave oven is hidden in a cabinet. To make the settee more comfortable for sitting and sleeping, Miriam used 6-inch foam in the cushions. To further add to guests&apos; comfort, she asked Drill&apos;s crew to use wide bands of flexible vinyl to support the settee cushions instead of the more traditional wood or fiberglass panels. The webbing offers some extra give, she explains. Four leather-and-wrought-iron chairs stand opposite the settee. The centerpiece of the saloon, however, is the Mexican Lady. A hollow terra cotta figurine about 30 inches tall that they bought in Mexico decades ago, she stands on the port side of the saloon and oversees all boating activity. Obviously, she is firmly attached to the boat. "She always has given us good luck," Miriam explains. Boarding is as easy as Bruce described. The simplest way is one step from the moorage float to the 24-inch-wide swim/boarding platform and then through a transom door. The Cullen cockpit is small, 4-1/2 feet deep, but it does have space for a couple of chairs for lounging at the end of the day. A hardtop extension covers most of the cockpit, providing protection from sun and sprinkles. For those who cruise frequently and who desire additional protection from the weather, the cockpit can be fitted with a fabric-andclear- vinyl enclosure. Exterior decks have a molded nonskid fiberglass surface. A Diamond/Sea-Glaze door opens to the saloon. The sitting area is aft, the galley forward to port and the main-deck head, hanging locker and desk are opposite the galley. Headroom measures 6 feet 6 inches in the saloon and 6 feet 4 inches throughout the rest of the boat. Moving forward, a couple of steps lead to the pilothouse. The helm is just left of center, while a stairway to the master stateroom is to the right. There are hinged Dutch-type doors on each side of the pilothouse. A settee provides a comfortable perch for visitors. Navigation equipment is properly centered at the helm. Many raised pilothouses are fully enclosed, probably drawing from the idea that they should be shielded from saloon lights while running at night. The Pacific Trawler, however, has an open pilothouse, the result of a redesign of the yacht interior by Lynn Senour, a Seattle naval architect. It is not a box. The person at the helm can see into the galley and saloon and has a good view of the stern, a blessing during a backing-down maneuver. The open pilothouse is appropriate for cruising in the Northwest, where driftwood (often large logs) is common. Drift is hard enough to see in the daylight; at night, if it&apos;s out there, you&apos;ll hit it. A hatch in the pilothouse sole provides access to the engine room. Cullen did not install a generator, leaving plenty of space for storage of parts and gear. The pilothouse doors lead to abbreviated side decks and to the foredeck. The starboard side deck goes up four steps to the boat deck and flybridge. The upper deck is bordered with a stainless steel railing, making it a safe spot for sunning. Down three steps and forward from the pilothouse is the compact master stateroom. Small it is, but nevertheless there is space for an island queen bed or the large V-berth chosen by the Cullens, or an off-center queensized double berth. Usually, there are two hanging lockers and other storage space. The Cullens gave up one locker and installed a second head in its place, but the large hanging locker in the saloon more than makes up the difference. Miriam&apos;s touch is obvious here, too. The space is bright, with her favorite earth tones adding soft, warm colors. Favorite pictures are mounted on the bulkhead above the bed. The 40 Pacific Trawler has a base price of about $325,000, but fitted out and taxes paid the total will be close to $400,000. Optional systems added by the Cullens include a Webasto furnace, a 2,500-watt inverter and an electronics package. Equipped with the 220hp Cummins, she will cruise at 8 or 9 knots and turn a maximum of about 10. Larger engines, at added cost, will make her go faster-up to a top speed of about 14 knots. There is no question that Seeley borrowed lines for the Pacific Trawler from West Coast workboats. It&apos;s obvious in the pilothouse, with its abundance of windows for good visibility, and in the long deckhouse. Drill has not tinkered with Seeley&apos;s design, except to add 3 feet to the 37. The hull shape and the appearance of the deckhouse are true to Seeley&apos;s drawings. The hulls for the first few 40s were molded in two pieces and then fastened together. Pacific Trawler since has built a new, full-length mold, and the hulls are built in one piece. The hull also was extended to include the swim/boarding platform, in effect increasing the waterline length of the boat slightly. Pacific Trawler builds about one boat a month in its Bellingham plant. So far, it has been building approximately the same number of 37s and 40s, but Drill said it is apparent the larger boat will become the most popular. The Pacific Trawler is a boat that can go nearly anywhere. In the Northwest, her semidisplacement hull will provide a stable ride in choppy seas. Her gently flared bow will keep the windscreen free of spray, and the raised pilothouse offers superb views. She can run easily at 8 knots while burning about 3 gallons of fuel an hour (with the 220hp engine). All of the Inside Passage is within her reach and capabilities. With 465 gallons of fuel aboard, a PT like the Cullens&apos; could travel Seattle to Ketchikan without refueling. Because they are busy professionals, the Cullens aren&apos;t thinking about Alaska or the Inside Passage. But they know how to have fun with a boat. They will have guests aboard for dinner, or sometimes they simply dine aboard at the dock. Their yacht is a comfortable home, and it should work well for guests and hosts. And, Miriam promises, she throws rousing dock parties with dozens of guests invited for a special meal. If Bruce has a free afternoon and needs to get away, he&apos;ll singlehand Caroline II out of the marina, motor across Elliott Bay and pick up a mooring buoy at the state park on Blake Island. With a cell phone and his laptop, he&apos;s still in touch; downtown Seattle is only a few miles away. He can relax, think about work, tinker with the boat, enjoy the weather. "That&apos;s hog heaven for me," he says. Often, they&apos;ll load up and take off for a couple of days together. They&apos;ll visit some of the charming small towns not far from Seattle on Puget Sound-Gig Harbor, Winslow, Poulsbo and LaConner farther to the north. When time permits, they&apos;ll head beyond to the San Juan Islands in northwest Washington or to the Gulf Islands in British Columbia. "We&apos;ve been boating here for eight years, and we&apos;ll never tire of going to places within a day or two of Seattle," Miriam says. "A weekend in Winslow (on Bainbridge Island, about 4 miles west of Seattle) is a wonderful experience. We go shopping, have dinner out, hang out on the boat." Bruce endorses the cruising lifestyle. "I&apos;ve never been a hiker or camper," he offers. "We like to go to marinas and plug into 110 volts. This is about as rough as it gets for us."